Located in New Brunswick, the Conservation Council of New Brunswick (CCNB) is a registered Canadian charity. They focus on environmental education and community engagement and provide research and offer solutions to protect the health of Canada’s environment. As a non-profit charity, the CCNB is overseen by a Board of Directors and operates day-to-day with a staff consisting of an Executive Director and a small core of full time employees. The CCNB needed to create an application that was both a public service and an educational tool as part of their local food program. The app needed to house a database of 300 local farmers and producers and about 20 farmers’ markets around the province that the app would promote, as well as geolocation services and access to Google Maps. The CCNB tried and evaluated multiple platforms, but Appery.io was the clear choice. According to Blair Cox, the CCNB’s Marketing Technologist, Appery.io’s ease-of-use, and clearly defined pricing and capabilities were an immediate draw, as was the fact that Appery.io included key features as drop-in modules (such as Google Maps). Appery.io’s ease of use and accessibility, even to non-programmers, enabled the CCNB to develop the application (BuyLocalNB) using their internal web developer resources. The CCNB expects that the app will help increase sales of local products and will become a key platform for marketing New Brunswick’s local food and agri-tourism industry. 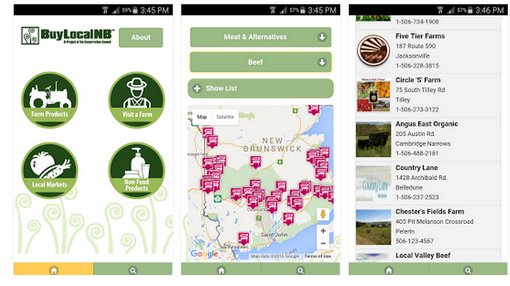 The CCNB’s mobile app was designed with the goal of increasing the accessibility of local farmers, artisans and food entrepreneurs and their products to New Brunswick consumers. This is achieved via a searchable database and a map of local famers and farmer’s markets. Originally published on Appery.io blog.